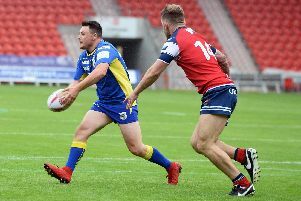 Doncaster RLFC kept themselves on course for the Betfred League One play-offs by beating Keighley Cougars 50-6 at Cougar Park. Despite playing with 12 men for over half the game the result was never in doubt with the Dons running in nine tries. Despite playing up the considerable slope the Dons were quickly out of the blocks and it took them less than three minutes to open their account - second-rower Frankie Mariano racing through a huge gap to score near enough for former Keighley favourite Matty Beharrell to convert. The home side hit back in spirited style and Mariano had to scramble the ball dead over the line to deny them a try. Keighley’s hopes of avenging a narrow defeat at the Keepmoat Stadium suffered a double blow. 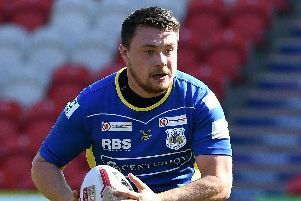 Strong-running prop Darrell Griffin, a man the Dons were reportedly interested in earlier in the season, limped off after picking up an ankle injury. Keighley were then reduced to 12 men for ten minutes when full-back Ritchie Hawkyard hit out at Beharrell after losing the ball in the tackle inside his own 20. The Dons wasted no time in cashing in on their numerical advantage and prop Russ Spiers burst through the Keighley defence close to the line. Beharrell again added the extras. They looked all set to add to their tally when Beharrell broke down the left but his try-scoring pass to Tali, who later put down a try-scoring pass from Beharrell, was ruled forward. The Dons, whose first half display had been patchy, added to their lead on the half-hour when Tali put winger Richard Owen over from close range out wide. The Dons were reduced to 12 men on 34 minutes when Australian Jordie Hedges was sent-off for a dangerous spear tackle on centre Cameron Leeming. Perhaps sensing that the game was not beyond them due to Hedges’ dismissal Keighley regrouped and but for Nathan Conroy dropping the ball in the over the line in the act of scoring they would have gone in just ten points down. Spiers gave the Dons the start to the second half they were wanting when racing clear and rounding the last defender to score within a couple of minutes of the restart. Beharrell’s conversion gave them a 22-0 lead. There would have been a try for Howden on 47 minutes had he held on to Brad England’s pass. Keighley winger Alfie Seeley went close at the other end in their first attack of the half prior to Doncaster centre Jack Logan touched down from Howden’s kick to the corner. Beharrell again added the extras. Owen put Tali over from close range as the Dons continued to make light of the fact that they were a man light. Just when it was beginning to look that the Dons would become the first side to nil Cougars at home for a number of years, winger Andy Gabriel touched down for a 67th minute try converted by Benn Hardcastle. The Dons quickly regained the initiative with converted tries by Sam Doherty and Jason Muranka (2). Dons: Sanderson, Doherty, Logan, Tali, Owen,Howden, Beharrell; Spiers,Kesik, Boyle, Mariano, England, Muranka. Subs: Hedges, Scott, Cross, Madani.